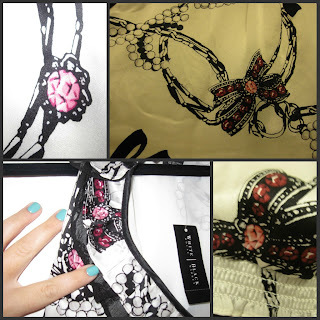 Fashion Beauty Friend Friday: My Favorite Clothing Piece! For FBFF this week, we are to showcase our most fashionable piece of clothing, showing the up-close details an OOTD (Outfit of the Day) post wouldn't pick up. I chose a BEAUTIFUL blouse I bought from White House Black Market. I know, simply stating it's from WHBM, it goes without saying how beautiful it is. The photo is not very flattering, I was hot and tired. I had just got home from running around like a mad woman, and wanted to get a picture with what daylight was left. The hemline is three tiers/levels: white silk, netting/mesh, and mesh. Which is also around the collar. And of course the JEWELRY. The black and white design of the blouse is modeled after jewelry, chains and bead strands. It's accented with pink and magenta gems. LOVE. What do you think? Oh, and I have yet to wear it anywhere, as evident by the tags still on it! Head on over to Ashley Getting Dressed to see what others showed! It's fab and you need to wear ASAP! I love the tiers at the hem too. The details are so nice! I love love the collar!